Available NOW – Exclusive STAR WARS LEIA’S STORY PRINT! MAY THE FOURTH EXCLUSIVE PRINT! ACME ARCHIVES will release “LEIA’S STORY” as a May The Fourth Be With You Exclusive print, and artist AMY MEBBERSON will be in person at Super7 this Saturday to personalize the prints and meet fans from 1~3pm. This delightful illustration presents Princess Leia Organa’s chronological progression (and costumes) throughout the Star Wars Original Trilogy. Measuring 24" long by 7" tall, the silkscreen print is signed by the artist, hand numbered, and comes complete with Certificate of Authenticity. Limited Edition (Copper Green/Brown Border) strictly limited to only 200 pieces, and available Exclusively from Super7! Prints will begin shipping the week of May 7th. If you would like to pick up your print during the MAY THE 4TH event, please select "HOLD FOR PICK UP" when checking out. 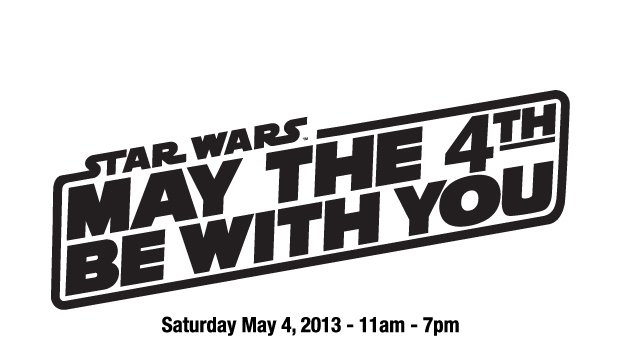 Click here for more info on Super7’s MAY THE FOURTH BE WITH YOU event! EXCLUSIVE STAR WARS LEIA’S STORY PRINT – AVAILABLE AT NOON TODAY! WIN GENTLE GIANT PRIZES – MAY THE 4TH BE WITH YOU!